For the 1936 film, see White Hunter (film). White hunter is a literary term used for professional big game hunters of European or North American backgrounds who plied their trade in Africa, especially during the first half of the 20th century. The activity continues in the dozen African countries which still permit big-game hunting. White hunters derived their income from organizing and leading safaris for paying clients, or from the sale of ivory. The popular term Great White Hunter emphasizes the racial and colonial aspects of the profession, as well as its colorful aspects. Depending on the author and intention, the term can be used straightforwardly, in parody, or as a criticism. White men from Western countries had been hunting big game in Africa throughout the 19th century, particularly in the more settled southern portion of the continent. But the region most associated with the term "white hunters" is East Africa. By the start of the 20th century, as part of the "scramble for Africa", Great Britain and Germany had taken colonial possession of territories on the eastern half of the continent—territories now recognized as the nations of Kenya, Rwanda, Uganda, and Tanzania. There were many factors that led to the spread of big-game hunting in East Africa, but two were foremost among them: first, a romantic European conception of hunting that combined aristocratic privilege and sportsmanship, and second, the desire by the colonizing powers to create new agricultural economies, to which unchecked animal populations posed a serious threat. Although the origins of the phrase cannot be confirmed, the first European to go by the title of "white hunter" is generally considered to have been Alan Black. Black was hired in the 1890s by Hugh Cholmondeley, 3rd Baron Delamere. Delamere employed both Alan Black and a native Somali hunter to lead safaris in Somaliland. As the story goes, in order to avoid confusion, the Somali was referred to as the "black hunter", and Black was called the "white hunter". Around the start of the 20th century, East African hunting safaris became a fashionable pursuit among members of the privileged classes, particularly in Britain and the United States. The completion of the Uganda Railway in 1901 provided easier access to the interior highlands of British East Africa (also known then as the East African Protectorate, and now as Kenya), where large game, especially elephants, lions, Cape buffalo, and rhinoceroses, was plentiful. The white hunter served these paying customers as guide, teacher, and protector. Typically, the hunter was hired or booked by an outfitting company (the first and most famous of these was Newland, Tarlton & Co. in Nairobi); the outfitter would make the local arrangements, gathering and packing supplies and hiring the many African workers without whom a safari was impossible. Porters, tent attendants, armed guards (known as askaris), horse-trainers, and gun-bearers, all worked under the supervision of a "headman". Before the mass importation of motor vehicles, most safaris traveled on foot and horseback and could employ anywhere from 50 to several hundred African workers. White hunters were colorful and romantic figures, often from privileged English backgrounds, who embraced a life of danger and adventure. The first acclaimed white hunters in East Africa were Alan Black, Bill Judd, Frederick Selous (remembered as the namesake of the Selous Scouts and whose real-life adventures inspired Sir H. Rider Haggard to create the fictional Allan Quatermain), and R.J. Cunninghame (sometimes spelled Cuningham), all of whom began their exploits at the end of the 19th century. 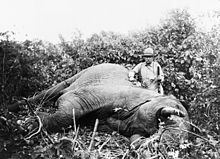 In 1909 Cunninghame was selected to lead what was probably the best-publicized African safari, Theodore Roosevelt's excursion into British East Africa. Roosevelt's fame and popularity, and his gift for generating publicity, prompted a craze for safaris among those who could afford the sizeable price tag. After the First World War, when Germany's colonial lands in East Africa were ceded to Britain, eager customers poured into Africa, creating a market for the skills of several more decades of hunters. Among the better-known white hunters who succeeded Cunninghame's generation were W.D.M. Bell, later known as "Karamoja" Bell; Bror von Blixen-Finecke, who was, between 1914 and 1926, married to Out of Africa author Karen Blixen; Denys Finch-Hatton, later her lover;Frederick Russell Burnham, Chief of Scouts in the Second Boer War to (Lord Roberts and known as "England's American Scout"; John A. Hunter; and Philip Percival and Frank M. "Bunny" Allen, whose safaris with Ernest Hemingway led the author to write Green Hills of Africa, True at First Light, The Short Happy Life of Francis Macomber, and The Snows of Kilimanjaro. The exploits of white hunters were subjects first for novels and later for films. They were romanticized in adventure novels of the so-called "Lost World/Lost Race" genre. "BY THE IMPERIAL noonday, then, the spectacle of the Empire was flamboyant indeed, coloured as much by Oriental despotism and barbaric gesture as by feudal example from nearer home. If it was modernist in some ways, it was antique in others. It embodied the marvellous energy of steam as well as the immemorial pride of horseflesh. It was queenly, but it was savage. It was partly the consequence of dukes, but partly the beat of jungle drums, and Imperial activists of every kind were recruited willy-nilly into its presentation: bishops beside viceroys, police officers and railwaymen, even sportsmen, foresters, jute merchants, river pilots or colonial accountants - all of whom, by their bearing, their demeanour or their costume, their pose at the wicket, the flutter of their gowns, the gravity of their presence behind the study desk or board-room table, contributed to the Imperial effect." Perhaps the first fictional Victorian adventure hero was Allan Quatermain, a white hunter who appeared in books by H. Rider Haggard, starting with King Solomon's Mines (1885). In 1924, Richard Connell published his short story "The Most Dangerous Game", in which an American big-game hunter finds himself being hunted by a Russian aristocrat who has tired of hunting in Africa; the story is still widely read. Alex Raymond created the Jungle Jim comic strip in 1934 that later lead to a comic book, film serial, film series, and television show. Geoffrey Household's novel Rogue Male (1939) featured a white hunter going after Adolf Hitler; it was filmed twice, first as Man Hunt (1941) and, a generation later, under the original title (1976). Captain CG Biggar, a supporting character in the P. G. Wodehouse comic novel Ring for Jeeves (1953), is another example of the white hunter. Not surprisingly, actual white hunters were often involved in the filming of the exploits of their fictional counterparts: Bunny Allen led many film companies on safari to enable location filming for King Solomon's Mines, Mogambo (1953), and Nor the Moon by Night (1958). The white hunter on safari in his khakis and pith helmet became an instantly recognizable stock character. Abbott and Costello lampooned the type in Africa Screams (1949), which was a parody of a 1930 documentary, Africa Speaks! (1930). Bob Hope parodied the safari genre in Road to Zanzibar (1941) and Call Me Bwana (1963). The phrase "great white hunter" probably has its origins in these popular depictions of safari adventures. Peter Capstick, a white hunter and an author of books on the subject, suggested that the word "great" may have been added by American popular culture. It was not a term employed or embraced by the hunters themselves. Its meaning, like many labels from the colonial era, is now shaded with parody or derision: it came to symbolize a perceived arrogance of western colonial powers toward the less developed parts of the world they controlled before the dismemberment of their empires after World War II. Volunteer travel which has been seen in a similar light of western self-fulfillment as voluntourism. ^ Brian Herne, White Hunters: The Golden Age of Safaris, Henry Holt & Co., 1999, pages 6–7. ^ Mandiringana, E.; T. J. Stapleton (1998). "The Literary Legacy of Frederick Courteney Selous". History in Africa. African Studies Association. 25: 199–218. doi:10.2307/3172188. JSTOR 3172188. ^ Pearson, Edmund Lester. "Theodore Roosevelt, Chapter XI: The Lion Hunter". Humanities Web. Retrieved 2006-12-18. ^ William M. Adams, "Against Extinction," Earthscan, p. 39. Herne, Brian (1999). White Hunters: The Golden Age of African Safari. New York: Henry Holt & Co. This page was last edited on 18 April 2019, at 14:33 (UTC).